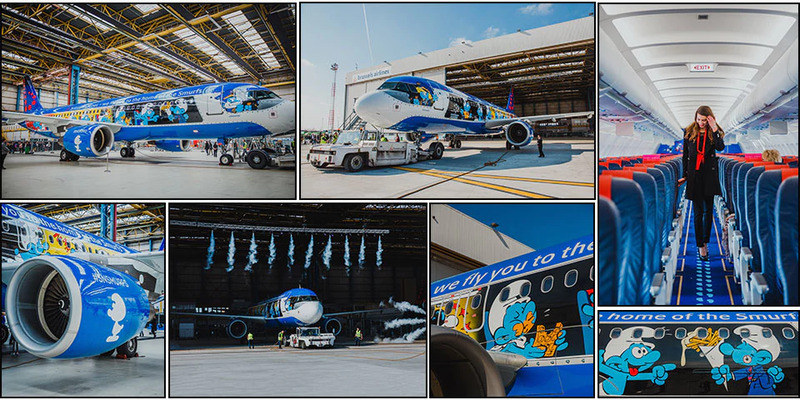 Brussels Airlines revealed its 5th airplane paint scheme featuring a Belgian icon. This one is called Aerosmurf and it honors those beloved small, blue characters known as Smurfs, which were created by cartoonist Peyo. Both the inside AND the outside of the airplane are Smurf-themed, with 19 Smurfs on the fusealage. “In the cockpit we find Smurfette as the captain and Papa Smurf as co-pilot. …On the left hand side Harmony Smurf is playing the Belgian national anthem on the saxophone – a Belgian invention – together with another smurf who is playing the harmonica, referring to the famous Belgian musician Toots Thielemans. On the crew smurf’s trolley we find a miniature Atomium. Inside, passengers will see Smurfs footprints on the carpet, see a Smurfs video and hear special Smurf-themed boarding music. The Smurf design is by Marta Mascellani, whose entry was the winner in a contest voted on by the public. Other liveries in the Belgian icons series honor the artist Magritte, Rackham (a Tin Tin themed plane), Trident (dedicated to the Belgian soccer team, the Red Devils) and Amare, honoring an iconic Belgian music festival. Here are some more AeroSmurf photos.